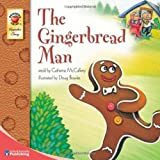 June 5th is... National Gingerbread Day, World Environment Day, National Attitude Day, Fly a Kite Day, Hot Air Balloon Day, Sen. Robert F. Kennedy Assassinated, World Campaign for the Biosphere Day, Festival of Popular Delusions. -- The freshly baked Gingerbread Man escapes from the oven and outruns all those who try to catch him. But will he be able to avoid the clever fox or end up as his tasty snack? Beautifully illustrated, this classic tale will capture children's interest and spark their imagination page after page, encouraging a love of reading that is vital to success in school and life. 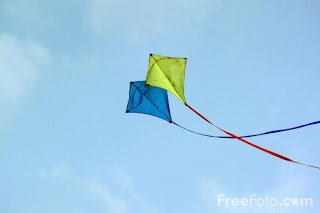 Read: Berenstain Bears Go Fly a Kite, by Stan Berenstain and Jan Berenstain. -- The story depicts the cubs trying to win a kite flying contest in which they also have to make the kite that they enter. Well, Papa thinks that he's the best kite maker around so he makes the cubs a huge kite. Since it is so big, they can't get it off the ground so he has Mama get the car to launch it with his fishing pole. Well, Papa forgets to let go of the kite and is soon airborne along with the kite. They wind up missing the kite competition but instead, Papa wins the stuntman award for wind surfing. -- An introduction to the art and history of ballooning. Readers learn the steps necessary for a successful launch; participate in a competition at a rally in Hastings, Minnesota; experience a safe landing; and observe the dismantling process. The colorful photographs extend the text and provide an intimate glimpse of balloon enthusiasts (children included) at work and at play. Aerial shots give a fresh perspective. Integrated with the descriptive text are facts about the Montgolfier brothers, who in the 1700s designed the first hot air balloon.